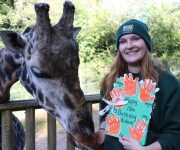 Kidderminster pre-school youngsters had a hand in wishing our giraffe Kubwa a happy 18th birthday today – 22 hands to be precise! Twenty two little ones from Little Acorns Pre-school in Far Forest added their handprint to a fantastic birthday card for handsome male Kubwa, who the pre-school have adopted. The children, aged two to … Continue reading Handmade card for Kubwa! On a high after proposal! 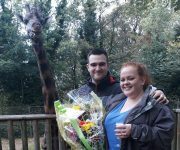 An Oldbury man is on a high after his girlfriend agreed to marry him during a romantic proposal in front of Dudley Zoo’s giraffes. 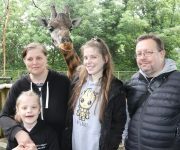 Our giraffes Kubwa and Josie witnessed the moment Ben Robson got down on one knee and popped the question to 20-year-old Tiff Cox, exactly a year to the day since they … Continue reading On a high after proposal! 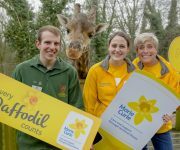 Dudley Zoo’s two giraffes have created some on the hoof art to raise funds for their threatened cousins in the wild. Two original canvasses, one painted by our 17-year-old male Kubwa and the other by nine-year-old female Josie, will be up for grabs in a raffle during our weekend event to mark World Giraffe Day. … Continue reading On the hoof art! Birthday girl Ruby Holloway definitely dressed the part when she came to DZG to feed her adopted giraffe, Kubwa. The eight-year-old Huntingtree Primary School pupil from Halesowen wore a black hoodie with ‘Kubwa’ printed on the sleeve and a pink t-shirt with his photo on. Both garments said ‘Kubwa’s Adopted Mommy 2018’ as the giraffe-mad … Continue reading Kubwa clothing! Kubwa’s up for birthday breakfast! Standing tall at 18 feet, you’d think it would be an effort for our birthday boy giraffe to get up from the floor. But watch how 17 year-old Kubwa pops up in seconds after spying keeper Josh arrive with his birthday breakfast! 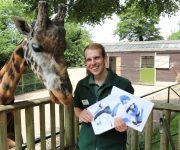 Trainee Keeper, Josh Luxton, said: “We know by looking at CCTV footage that … Continue reading Kubwa’s up for birthday breakfast! 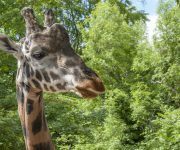 It’s a big day for our handsome Rothschild’s giraffe, Kubwa, who’s celebrating his 16th birthday! 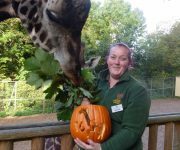 And keepers treated the birthday boy to some of his favourite browse delivered in his own personalised carved pumpkin, as his big day falls in our half term Freak Week – and don’t forget we’re offering discounted admission to visitors this … Continue reading Happy Birthday, Kubwa!